The glorified accounts of Indian fighting served to confirm the belief that Indians were bloodthirsty savages. To the majority of Americans, most of whom were living in the East, Indians were a distant enemy that stood in the way of progress and expansion. To the pioneers who sought to settle the West, warring Indians were a daily fear. But gradually, once American Indians had been pushed onto distant lands that no white person wanted, they began to be seen as semi-mythical creatures. A new version of the myth of the noble savage glorified famous Indians of the past. Perhaps the best-known purveyor of this type of story was James Fenimore Cooper, a novelist of the 1820s whose works remained popular well into the 1900s. Cooper had little if any contact with American Indians and presented both the “noble” and the “savage” stereotypes in his books. Henry Wadsworth Longfellow’s famous poem The Song of Hiawatha (1855) was another product of the vogue for romanticizing the American Indian. By the late 1800s, mythical Indians had become stock characters in a new kind of popular fiction—the Western. The old images of “good” and “bad” Indians were used again and again in dime novels. There were a few trustworthy Indians, typified by the Lone Ranger’s faithful Tonto, who helped whites. And there were evil, treacherous Indians who swooped down to attack defenseless wagon trains with murderous yells. Popular shows helped spread the myths—Buffalo Bill’s Wild West, for example, presented matinee reenactments of Custer’s Last Stand. These stereotyped images were confirmed again in movies and on television. Whites believed the Indian stereotypes presented in Westerns because, in most cases, fictional Indians were the only ones they ever saw. By 1890, wars and disease had reduced the total American Indian population to about 250,000, compared to a population of about 2,500,000 before European contact. As their numbers decreased, the strength of the tribes often dissipated. One by one, the tribes were consigned to reservations in strange and often hostile places. The government gave them farming tools and rations and set up schools, and whites in general expected that the Indians would gradually see the benefits of “civilization” and give up their traditional ways. But the change from a free way of life to the restrictions of the reservation brought despair. Social problems—poverty and alcoholism in particular—were severe. Prejudice prevented whites from seeing the social causes of these problems; instead, the Indians themselves were held responsible. 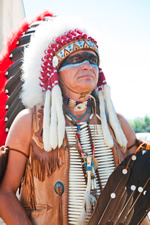 Thus the “good” and “bad” Indians of the Westerns were seen as belonging to the historical past. In the rare occasions when whites thought about or saw the actual residents of reservations, the image that emerged was more like that of the “Goshoots” described by Mark Twain—creatures to be viewed with contempt. - Pascoe, E. (1997). The American Indians - Aliens in their Own Land. In Racial prejudice why cant we overcome? (pp. 68-71). New York: F. Watts. The preceding section contained information about the Native American image. Write three case study examples regarding how you might use the content of this section in your practice. Why did whites believe the Indian stereotypes presented in Westerns? Record the letter of the correct answer the CEU Answer Booklet.